The pursuit of perfection in the tiniest of details is essential to the end result. 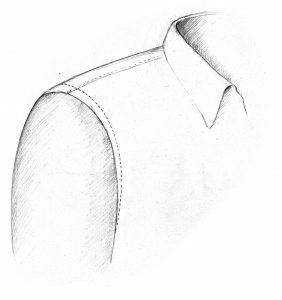 The stitching on the shoulders, sides, wrist slits and front buttonhole bands is all performed with great precision, without ever neglecting the continuity of the design. The sleeves are set in and tacked by hand, a technique that allows us to create variable-width stitching that gradually decreases, creating a feel and wearability that is hard to achieve with automatic production processes.